Quick clocking in using facial recognition. Advanced level time & attendance solution. GeoFace 200 by Time Systems UK is a advanced level time clocking in machine with Time & Attendance Software. 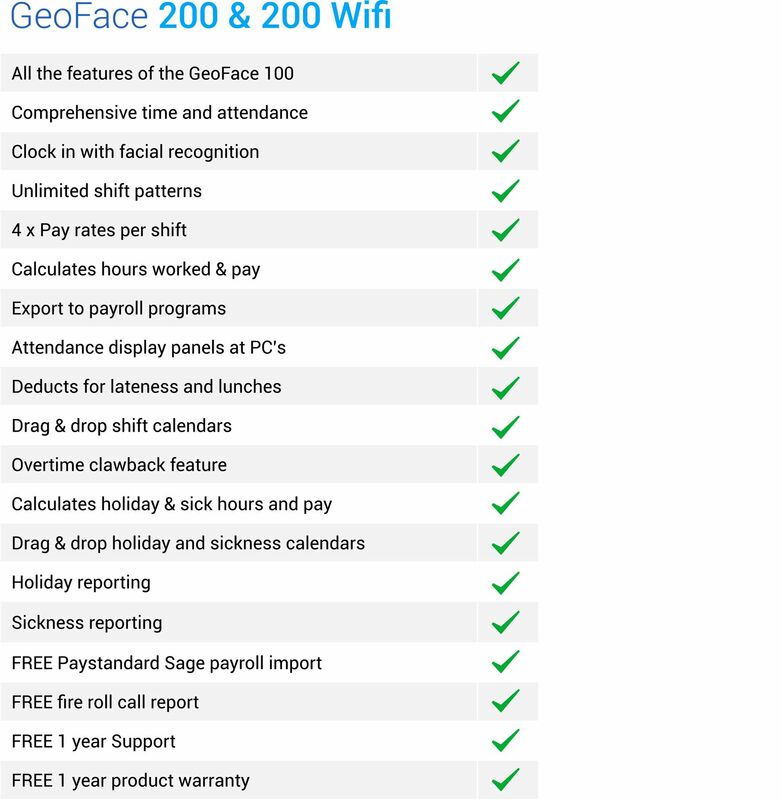 The GeoFace 200 features holiday and sickness calculations, network ready, Fire Roll Call, Sage Payroll Import, additional Payroll Export, Key Personnel Displays. Includes 30 Days Free Software Support + 1 Year Free Hardware Warranty. Each employee presents their face to the GeoFace 200 clocking in terminal and once recognised this creates an in/out transaction. The terminal displays the result of the attempt along with an audible message. You can then add, modify or delete any transactions in your included time & attendance software at your PC. Overtime can be applied by time of day, day of week, after x hours per day, after x hours per week. The software calculates hours worked, sorts pay into standard and overtime - even deducts for any breaks so you don't have to! Also allows you to add, edit or delete transactions - to restrict too much overtime - easily add transactions for drivers and remote workers. Overtime can be accrued by number of hours worked, by time of day (time band), by shift, day of week and pay period. You can name overtime rates to suit you. 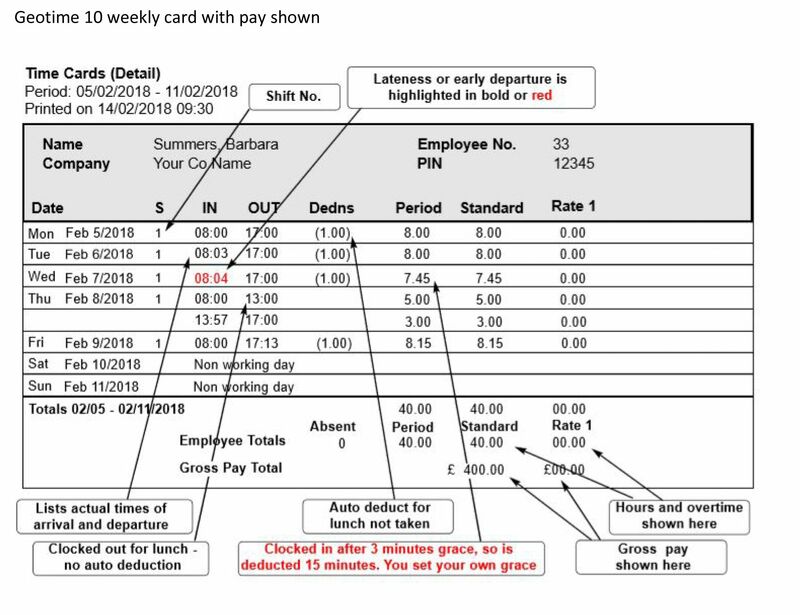 The Time Systems UK software has intelligent rounding rules so you only pay for the exact time worked. Round forward/back for late arrivals, long lunches, early departures, lunch not taken - so you only pay for the hours worked. Using our Pay Rates feature you can accurately calculate your employees pay without the need for expensive payroll systems. This can be printed directly on time cards for distribution to employees. Keep track of holidays taken as well as the number of sick days an individual has had. You can also track paid and unpaid leave. All of our Time and Attendance products can help you achieve full compliance with the Data Protection Act 2018/GDPR. From 2019 this product will support you in managing your legal retention requirements against your deletion policy/requests, allowing you to delete any and all data in line with your own internal policies - ensuring that you remain fully compliant with your own policies and hopefully any new Data Protection laws. Recognition entries are never stored, they are simply translated into a unique unduplicable code. GeoTime 200 software is multi-department, multi-company and can run on a stand-alone PC or networked. Standard Windows Intel-compatible 32 bit or 64 bit processor (Intel, AMD etc.) with no sub-system restrictions. Windows 7, 8.1 or 10 (Excluding 10 S), 1GB RAM, 200MB free hard drive space. Standard USB Type-A port or CAT5 ethernet adaptor or serial port or USB port when using USB to COM adaptor or connection. This product is not intended to be used under emulation packages such as WINE, Remote Desktop Solutions, Virtual environments, beta or preview versions of Operating Systems. GDPR compliant. Does not store finger prints and has features to help your legal retention requirements against your deletion policy/requests, allowing you to delete any and all data in line with your own internal policies. You can export your time card data and other information to 3rd party payroll or Excel spreadsheets. GeoFace 200 can export to almost all known payroll systems. GeoFace 200 comes complete with PayStandard Software - Our Sage Payroll import program. With a PayStandard payroll link these figures can be imported into Sage Payroll, safe, reliably and automatically. Automatically calculates the correct figures for payroll input. 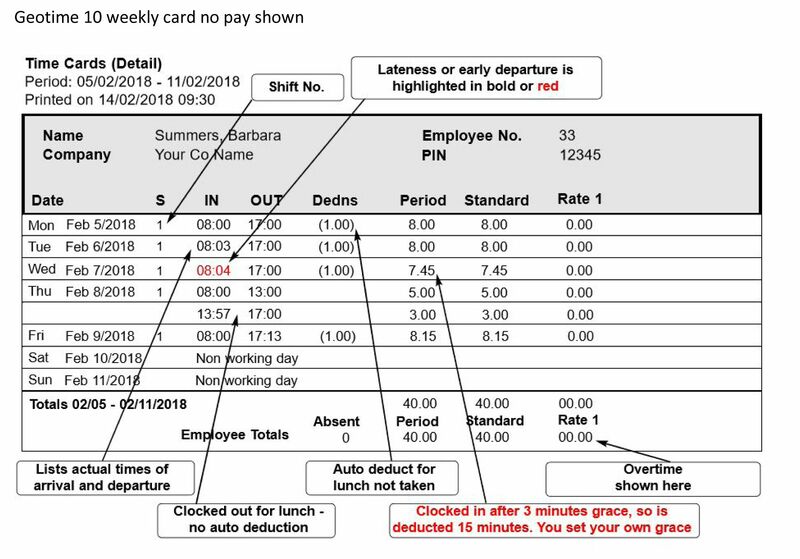 You can export your time card and other data from GeoFace 200 for use in other payroll packages or Excel spreadsheets. GeoFace 200 exports all data to a file in CSV format for use in Excel and almost all known payroll systems. GeoFace 200 Automatically calculates the correct figures for payroll. 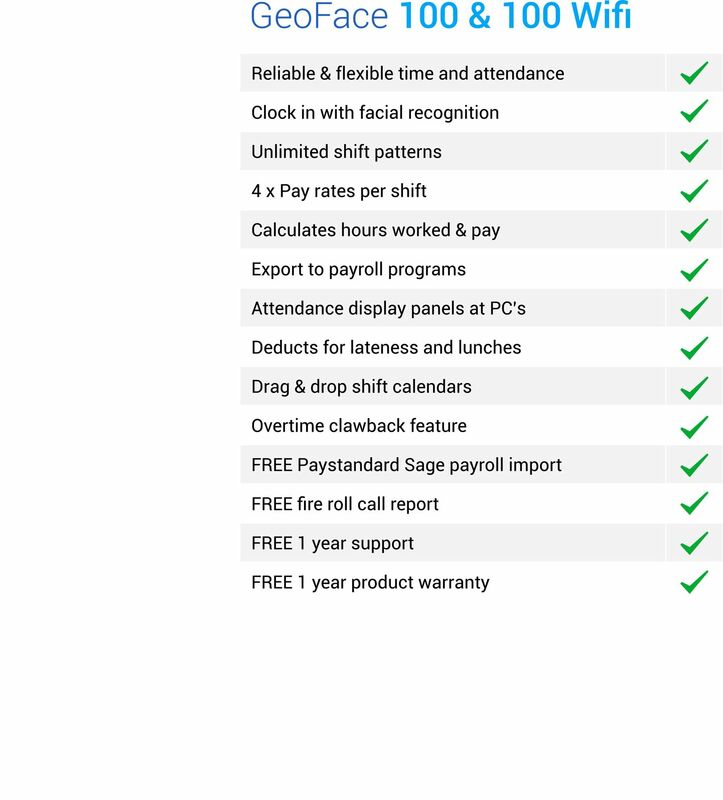 Below is a software comparison for software options that will come with your new time & attendance system.